TrafficCountersOnline.com introduces... The MicroTally 18! The MicroTally 18 is a turning movement counter primarily used to manually count vehicles, pedestrians, and bicycle movements in intersections. However, the Microtally 18 is far more versatile than that. 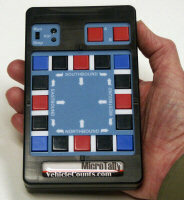 It can be used in nearly any tally (or counting) situation that you might have, assuming the keypad layout makes sense.